The tools are mounted on one table with the locking castors. The unit appears to be complete with the exception of motor and the four pulleys. 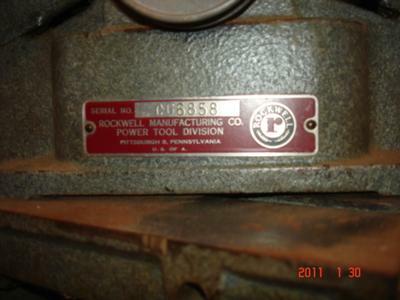 Each unit has a Rockwell / Delta identification plates. These ID tags have only serial numbers but no model numbers. I want to buy the correct motor and pulleys but each place I've looked has listings by model number. I would also like to find the age of the unit. My end goal is to use this tool as a jointer and leave the saw for dado blades. It is solidly built and in good repair. I have the same unit and would also like to find the age and parts for mine. You should be able to buy the original manuals for both units and there is numerous providers of the technical literature right on the internet. I have found that these manuals usually indicate the motor RPM which is the first step. In the case of my Delta 4 inch jointer, I was able to see the size of one pulley and then all I had to do was calculate the size of the other pulley. I also found a web site that helps you determine pulley size in relation to motor speed. Someone may correct me but I think that you divide the motor pulley size by the cutter head pulley and then multiply it by the motor speed.Example- a 7.0" inch motor pulley divided by a 2.25" diameter cutter head pulley times 1725 rpm motor= 5,366 rpm. Be careful when you start using 3450 rpm motors without knowing what size pulleys to use or you might just exceed the speed of sound, melt your bearings, and have an uncontained failure that will look like a Rolls Royce engine on an A380 Airbus after a a similar event.